We know when your fans are online! Many business owners have great content available. They have access to the best photos and information. BUT they are so busy during the day that they end up posting the amazing photos 1 AM! A posting at 1 AM, for most businesses, means they will reach a very limited audience. There are specific days of the week and times when Facebook users are online and ready to engage. Tufel Media helps you take advantage of these specific times to reach the most engaged audience possible. We have the blueprints to help you beat your competitors! Facebook has its own metrics that tell us this. Not only does Facebook know what time of day their users are most engaged, but they also know what day of the week has the most users online, and more specifically for your page. 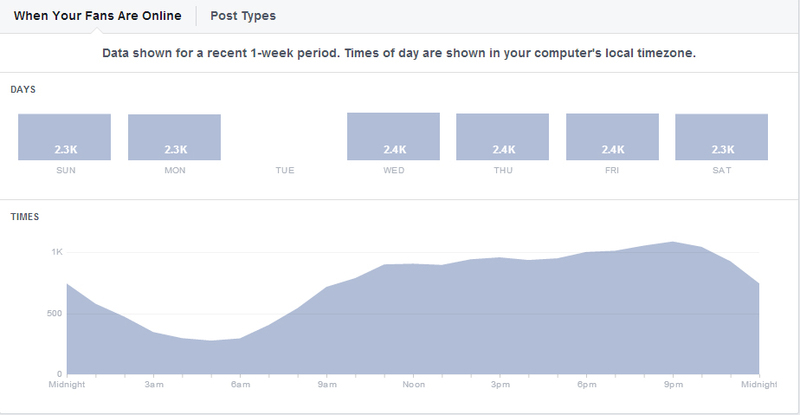 The measurement reports available to all Facebook Pages are called Page Insights. Tufel Media uses these Page Insights along with reports from other sources such as Hootsuite Pro and others, to capture your most engaged audience.